A familly was searching for an architect to assist with additional living space requirements in Dunboyne, Co. Meath, near Dublin. 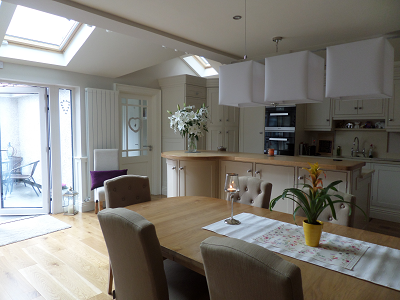 CK Architecture was appointed for the design of a single storey rear extension with refurbishment. 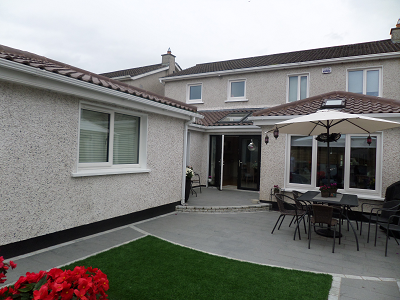 The clients own a detached 4 bedrooms dwelling built with a large rear garden within a residential estate of Dunboyne. The ground floor of the dwelling was restrictive and additional space was required. The brief included for an additional bedroom with ensuite at ground floor to be used by a relative in need of care. The brief also included for a large kitchen / dining area as well as more sunlight to enter the rear of the house, orientated South. The existing dwelling already included for a 12 square metres conservatory, and the clients were aware that the required extension would need planning permission to be granted by Meath County Council. A utility room and ground floor WCs were also to be preserved or relocated if necessary. 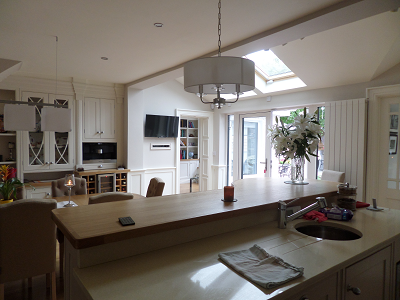 At first floor the clients were looking to enlarge an existing bathroom, using space from one of the bedrooms. During July 2015, a notice for commencement of works was submitted to Meath County Council. All construction works were completed in January 2016. There were delays on the project caused by additional works which were not included in the original design, such as the re-tiling of an existing conservatory roof, as well as additional plaster, electrical points and plumbing work. The contractor, who had built only 3 house extensions prior to the start of the project, had under-estimated some aspects of the workload and experienced difficulties with technical parts of the works as well as with sub-contractors, causing further delays on the project. The extension was completed in January 2016, instead of November 2015, as anticipated prior to the start of construction works. We carried out periodical inspections during construction and instructed the contractor for compliance with planning permission and building regulations.